Norbert Haller, head of design at Ultra Motor Ltd., looks back over more than 10 years of designing and developing new electric mobility concepts. The latest example of his individual, minimalist style is the A2B vehicle line of Ultra Motor. In an interview with ExtraEnergy, Haller explains the key challenges in LEV development from a design point of view. EE: Mr. Haller, the industry is at a turning point where it needs to establish light electric vehicles in the market and ensure future demand. With the A2B your design team presented a promising concept. What is the story behind it? NH: We all know it is not enough to put a motor on a bicycle to create an attractive electric two-wheeler. To transfer a combustion engine vehicle concept to electric does not work either, because the price and performance of a motorcycle, or scooter, are hard to match with an electric drive system. We need to come up with new concepts. The A2B is an attempt to create a new vehicle type - something between a bicycle and a motorcycle. The market needs urban transportation vehicles that look cool, are fun to ride and, at the same time, offer a lot of practical value. In other words: A new generation of vehicles needs to be green, high-tech and set a lifestyle trend. EE: Wherever the A2B was shown, people liked it. How would you describe its individual style? NH: The A2B is modern looking, thanks to its overall design, the choice of material, surface treatment and the selection of high-end components. In order to attract a wide range of people we avoided a futuristic race-look. Instead, the A2B rider sits in an upright position and rides along in a relaxed manner. It was especially important to us to fully integrate the drive system into the overall vehicle design and give the A2B a design language of its own. EE: What's the vocabulary of this design language? NH: Reduced, clear, and honest. By “reduced” I mean that the styling underlines the actual function of the vehicle. The construction itself is the design. No plastic covers, which easily make a vehicle look like a toy, or “handicapped”. “Clear” means there are no fancy curves, shapes or patterns. All A2B models follow the same straight-lined design principal and even without decals you would immediately recognize an A2B from it's style. All cables are hidden to ensure a tidy appearance. “Honest” means the vehicle shows what it is: You can see the manufacturing of the aluminum frame, the mere metal, the welds. This kind of simplicity creates a feeling of power and strength. The A2B does not necessarily look fast, but elegant, solid and authentic. EE: You are a bike enthusiast yourself. How has your own lifestyle influenced the A2B design? NH: Long-distance, full suspension and small wheels give the A2B a bit of a mountain bike/ BMX/ motocross look and reveal some of my cycling background: I used to ride races in different bike disciplines. The A2B has 'inherited' some of my BMX and downhill times, so to speak. And I have a passion for classic motorcycles like the old Indians, Harleys and Vespa scooters. Their upright riding position, unhidden technology and artful workmanship have influenced the ergonomics of the A2B and the attention to small detail, such as the imprint in the leather seat, or the stitches of it’s cover. EE: How do you make sure the design meets the high performance demands? NH: Full suspension and a cushy seat ensure the A2B is very comfortable to ride. Thanks to its 3-inch tires people feel safe. It can easily carry goods. Ultra Motor will come with a wide range of accessories such as bags and baskets that match the A2B style and extend its practical value. Although it looks a bit like a bicycle, it performs more like a scooter - at much lower weight. High-end Li-Ion cells ensure a range of around 50 km. With an additional battery box, the range can be extended. The A2B concept works for all different kinds of two-wheelers. We are talking about an entire vehicle family not just about a single vehicle. Thanks to its modular structure we can produce different types of vehicles with the same frame construction and adapt them to adapt them to different market needs and regulations. 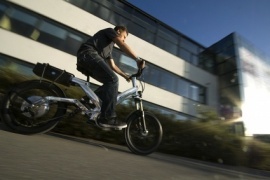 The A2B can, for instance, be a pedelec, e-bike, speed pedelec over 25 km/h, an off-road vehicle, or a scooter. The great advantage of this modular structure is that production cost and development time of various models can be significantly reduced. For our customers this means that they can choose from a larger variety of high-end vehicles at a comparably low price. EE: What are the biggest challenges in developing such a new vehicle concept? NH: The toughest part is to find the best compromise of perfect design, modern technology, best possible performance, and lowest possible price under the demands of a certain vehicle category. Deciding upon a vehicle category has significant consequences upon the choice of components from a legal point of view and also for the targeting of user groups. The design has the task to attract these target groups, represent the actual performance and integrate the technology in a way that the entire vehicle looks as if it was made of a piece. It’s a big challenge for all LEVs to be lightweight and still fulfill acceptable performance criteria. We can't follow price points and performance demands of combustion engines vehicles here. Instead, we have to define individual specifications. A big part of the development job is to find existing parts that match the function, design, price and regulations, or modify them. In order to reduce costs we designed parts such as the frame in a way that they can stay the same for future vehicle variations. EE: How long did it take to develop the A2B from scratch to production? NH: I have been working on a modular concept like this for almost all my career. With every project, it grew a bit further. At Ultra Motor we started working on the A2B in early 2007 with a large, multi-cultural team located in the US, England, Germany, and Taiwan. We finally launched the US version in September 2008. A product line for Europe will be introduced at this year’s Eurobike. And we continue working on new A2B models. EE: Do you think people are ready to switch to new mobility? NH: Yes, I think consumers are open towards new drive technologies, especially if they are zero, or low emission. The positive response to the A2B has shown that people are attracted by something new and different. New concepts for vehicles and public infrastructure are the key to explore this new market. EE: What has changed in people’s perception of style? NH: People today pay a lot of attention to design. With the iPod, lifestyle products have reached the masses. While “style” has become ever more important the perception of “young”, in terms of age, has lost its significance. It definitely has for the target groups of the A2B. A young mind-set is what counts. The “cool” people of today are open to new trends and prepared to change their way of thinking. Actually, the kids from back then, when I started BMX racing, are now often leading the trend sports. They come along with cool outfits, set the benchmarks for today’s kids and bring Mac computers and iPods to their parents. The homage to good style has reached all generations. EE: Do you ride an A2B yourself? NH: Sure! It’s a cool vehicle that I like to identify myself with. ? Norbert Haller studied industial design in Berlin. Before that, he completed an education as toolmaker and knew about the challenge of creating good-looking AND producible products from a manufacturer's point of view. At the University of Art in Berlin he got to know the perspective and skills of a designer. As a diploma project Norbert Haller and his university friends, and later working partners Johannes Cremer and Heinz Redlich, built three pedelecs in classic and futuristic design. The prototypes drew a lot of attention at Eurobike 2007, where they were exhibited at the booth of Hawk Bikes. The eye-catching pedelecs turned out to be groundbreaking for the further development of electric bicycles, which was at it's very beginning at that time. As CEO of the Berlin-based design office Craftsmen Cremer Haller GbR, Norbert Haller developed and designed bicycles, pedelecs, small electric scooters and other light electric vehicles for international manufacturers. In 2007 he joined the London-based company Ultra Motor as head of their design department, which is located in Berlin. Interview and photo: Susanne Brüsch?